A number of Accessible Information Standard (AIS) Champions from the Trust have taken a huge step towards helping blind or partially sighted patients, after undertaking a course with Guide Dogs UK which helps understand how to help visually impaired people around our hospitals. The course forms part of the Trust’s commitment to the Accessible Information Standard (AIS) which was set out by NHS England in 2016. The AIS law ensures that all places that provide health and social care have to follow the standard and means that people who have a disability, impairment or sensory loss (such as hearing or eye sight) get information that they can easily find and understand. 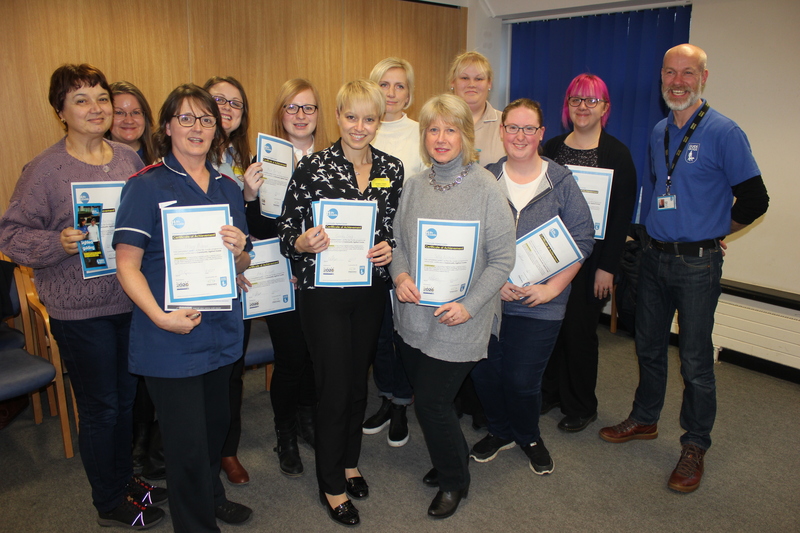 The session at the Academic Centre at Maidstone Hospital on 24 January featured the second group of staff to complete the My Guide programme, with attendees qualifying as Level 1 Community Sighted Guides. The course included advice on how to identify someone who is visually impaired who might be in need of help, as well as how to approach them and guide them across roads, down corridors, through doors and up and down stairs. Staff also had the chance to put their new found knowledge into action, when they were challenged to guide a blindfolded colleague around the Academic Centre, navigating them on a tricky course through the building.